Santa Marina is an uber-luxe retreat for explorers and collectors of the world’s island idyll experiences. 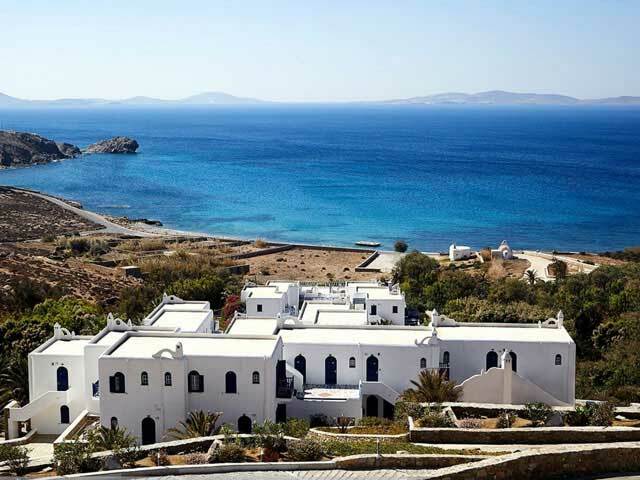 Set overlooking the exquisite and iconic Ornos Bay, Santa Marina crucially commands the only private beach on Mykonos, making its transparent turquoise waters and white silk sands a genuine sanctuary from the public eye. Rooms and suites all have beautifully refurbished designer interiors and panoramic sea views from their individual balconies. Our private villas were built to take maximum advantage of the spectacular sea views, while affording the utmost privacy to guests. Throughout the property, traditional, sugar-cube Mykonian architecture is woven through sparkling private pools, terraces and lush gardens. The New Superior Rooms design concept is a contemporary elegant décor, maintaining the resort’s world-class character, providing a sophisticated feel with partial seaviews from its private balcony. The new interiors will aim to offer all the modern comforts of a luxury accommodation and elegant washrooms. The New Superior Seaview Rooms design concept is a contemporary luxury décor, maintaining the resort’s world-class character while simultaneously providing a sophisticated feel with majestic seaviews from its private balcony. The new interiors will aim to offer all the modern comforts of a luxury accommodation and sumptuous washrooms. The New Deluxe Seaview Rooms design concept is a contemporary luxury décor, maintaining the resort’s world-class character and are elegantly appointed with a sitting area, providing a sophisticated feel with panoramic seaviews from its private balcony. The new interiors will aim to offer all the modern comforts of a luxury accommodation and sumptuous washrooms. The New Seaview Suites design concept is a contemporary luxury décor, maintaining the resort’s world-class character while simultaneously providing a sophisticated feel with panoramic seaviews from its private balcony . The new interiors offer a stylish lounge with all the modern comforts or a luxury accommodation, including walk-in closets for some and sumptuous marble washrooms. The New Deluxe Seaview Suites design concept is a contemporary luxury décor, maintaining the resort’s world-class character while simultaneously providing a sophisticated feel with panoramic seaviews from its private balcony. The new interiors offer a separate stylish lounge with all the modern comforts or a luxury accommodation, including walk-in closets for some and sumptuous marble washrooms. The New Family Seaview Suite design concept is a contemporary luxury décor, maintaining the resort’s world-class character while simultaneously providing a sophisticated feel with two bedrooms and panoramic seaviews from its private balconies. The master bedroom is on the ground floor overlooking the sea with a charming sitting area. The second bedroom (two twin beds), is separated by a few stairs leading to the upper level, where it has its own bathroom and balcony. The Deluxe Seaview Suites with Pool new design concept is a contemporary luxury décor, maintaining the resort’s world-class character while simultaneously providing a sophisticated feel with panoramic seaviews as its backdrop. Inside, a sublime living room is equally suited for business and leisure, while the separate bedroom is distinguished by its own seating area and a spacious walk-in closet. Comfortable patio furniture is adjacent to a tranquil private pool, which in some suites is surrounded by a lush garden. This two bedroom designer Villa has been made to the highest standards with all the luxury, comfort and facilities needed for the most desirable experience. The Villa is a complete house with two bedrooms and two bathrooms, a guest bathroom, spacious sitting room and dining room, outdoor dining, fully equipped kitchen and outdoor terrace. The villa is built on a hill with breathtaking sea-views. Ground floor: Master bedroom with en-suite bathroom and second ensuite bedroom, each opening to a spacious terrace. Additional guest toilet. The rooms are spacious with magnificent views of the sea and the island. First floor: Spacious living room, dining area and kitchen. Outdoor: A spacious terrace with lounge rattan sofas and dining table. 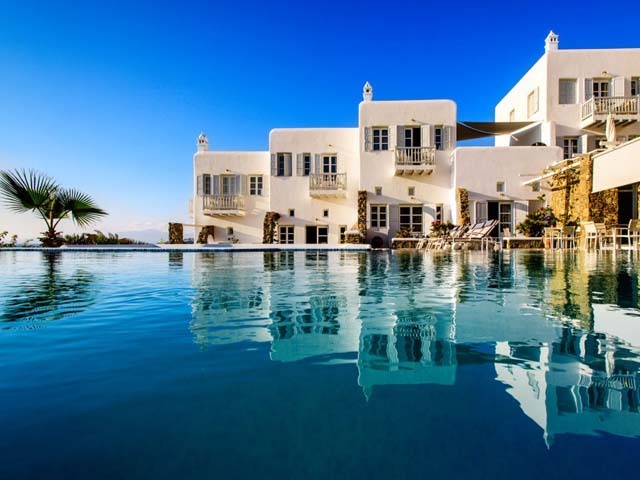 Situated in lush gardens overlooking Ornos Bay, our Mykonos Villa Crystal is completely self-sufficient and includes a living room with sitting and dining areas, as well as a kitchenette. For a breath of salty fresh air, step out onto the spacious terrace, which houses an infinity pool perfect for lounging and enjoying the incomparable vista while sipping a beverage from the mini bar.In a unique private setting, this charming villa offers a master room with king bed opening to a private poolside patio, a second room with twin beds and two en-suite bathrooms equivalently. Additionally the sitting room, dining area and kitchenette are complimented by a plethora of majestic seaview verandas. Ground floor: Sitting room, dining area, and open kitchen lead to a spacious terrace with outdoor dining, lounge, swimming pool, (fresh-water, 7,20m x 4m), and beautiful sea views. Two bedrooms, (master with one king size bed, second room with twin beds and en-suite bathrooms). Our three-bedroom Villa offers to our guests complete autonomy. 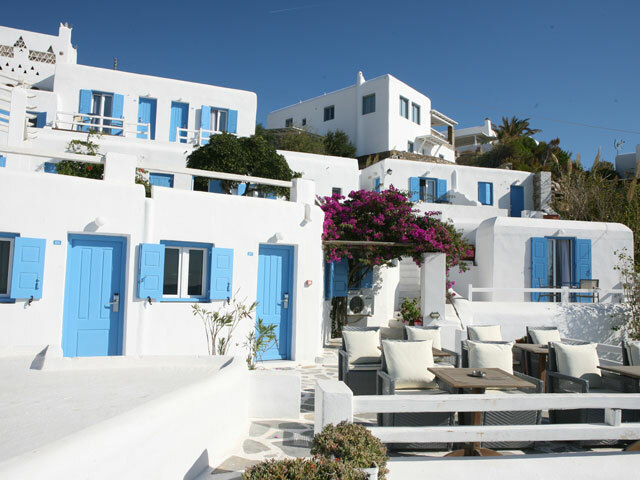 the decoration characterizes Mykonos island style, as peach-hued walls meet whitewashed ceilings and contemporary wooden furniture. Splashes of color come courtesy of modern artwork and plump lounge pieces. Outisde, expansive balconies with dramatic views are furnished with chaise lounges and house private infinity pools that seem to flow seamlessly to the Aegean Sea.This three bedroom designer Villa with infinity pool has been made to the highest standards with all the luxury, comfort and facilities needed for the most desirable experience. The Villa is a complete house with three bedrooms and three bathrooms, a guest bathroom, spacious sitting room and dining room, outdoor dining, fully equipped kitchen and private infinity pool. The villa is built on a hill with breathtaking sea-view. Splashes of color come courtesy of modern artwork and plump lounge pieces. Outisde, expansive balconies with dramatic views are furnished with chaise lounges and house private infinity pools that seem to flow seamlessly to the Aegean Sea. Spacious living areas, these are the settings of our sapphire three bedroom villa. All bedrooms are decorated in soothing tones and have a king-size, queen, or two single signature Luxury Collection beds draped in 250-thread-count sheets.This three bedroom designer Villa with infinity pool has been made to the highest standards with all the luxury, comfort and facilities needed for the most desirable experience. The Villa is a complete house with three bedrooms and three bath - rooms, a guest bathroom, spacious sitting room and dining room, out - door dining, fully equipped kitchen and private infinity pool. The villa is built on a hill with breathtaking seaviews. High atop the cliff enjoy privacy in a luxury villa overlooking magnificent views over the sea and surrounding Aegean islands. This charming three-bedroom villa features a spacious sitting room and dining room, outdoor dining, fully equipped kitchen and a private whirpool, leading to a spacious terrace with teak furniture, (lounge, sun chairs, dining). Elegant bedrooms include a spacious master has a king bed and ensuite bathroom. and two more bedrooms on the upper floor, one with Kingsize bed and one with two twin beds and en-suite bathrooms. All enjoy panoramic sea views. Ground floor: Spacious living room, dining area, and fully equipped kitchen opening to a spacious terrace with pri - vate outdoor whirpool, (fresh-water), teak outdoor dining, sunchairs, lounge and beautiful sea views. Master bedroom (with kingsize bed) and en-suite bathroom. Emerald Villa with infinity pool has been made to the highest standards with all the luxury, comfort and facilities needed for the most desirable experience. Villa is a complete house with three bedrooms and three bathrooms, a guest bathroom, spacious sitting room and dining room, outdoor dining, fully equipped kitchen and private infinity pool. 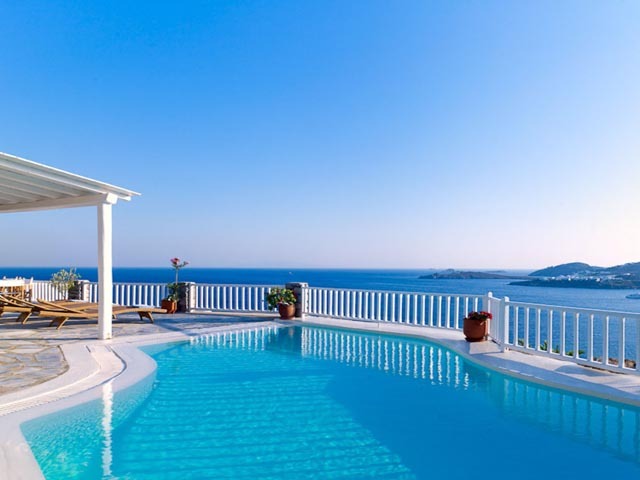 The villa is built on a hill with breathtaking seaviews. Ground floor: Spacious living room, (Flat TV/Satellite & Movies, DVD, CD player), dining area, kitchen (fully equipped). One spacious master bedroom with ensuite bathroom, (king bed) and sitting area. Infinity Pool, (sea-water, 6.45m. x 3.50m) and a large terrace with teak furniture, (lounge, sun chairs and outside dining). Built on the resort’s hill, overlooking the incandescent sea, Villa Ruby provide the utmost comfort in elegant, spacious surroundings. A generous terrace area houses an outdoor dining area alongside a smooth-as-glass infinity pool surrounded by teak furniture. Sit poolside to watch the sunset while sipping on a drink from the mini bar. This four bedroom designer Villa with infinity pool has been made to the highest standards with all the luxury, comfort and facilities needed for the most desirable experience. The Villa is a complete house with four bedrooms and three bathrooms, a guest bathroom, spacious sitting room and dining room, outdoor dining, fully equipped kitchen and private infinity pool. The villa is built on a hill with breathtaking sea-views. First floor: Two bedrooms sharing bathroom, (one with queen bed and one with two twin beds). Both rooms open to their own private balconies. Each room is spacious with magnificent views of the sea and the island. This four bedroom designer Villa with infinity pool has been made to the highest standards with all the luxury, comfort and facilities needed for the most desirable experience. Villa is a complete house with four bedrooms and three bathrooms, a guest bathroom, spacious sitting room and dining room, outdoor dining, fully equipped kitchen and private infinity pool. The villa is built on a hill with breathtaking seaviews. Main Floor: Spacious living room, dining area, and fully equipped kitchen opening to a spacious terrace with its own garden, swimming pool, (fresh-water, 12 x 5m), teak outdoor dining, sunchairs, lounge and beautiful sea views. First Floor: Master King Bed with en suite bathroom and 1 Single bedroom (140x200) with bathroom. Ground floor: 4 Bedrooms: 2 rooms have 2 King beds each & 2 with two twins beds each, all ensuite bathrooms. Situated at the top of our 20-acre property, lies the gem of our elegant resort – our Presidential Villa. 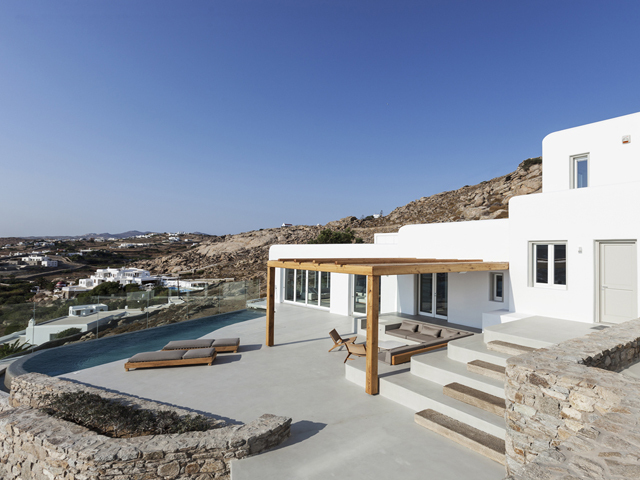 This exclusive four-bedroom villa has been constructed to take advantage of its stunning natural setting with magnificent views over the sea, Aegean islands, (including Ancient Delos, Paros and Naxos) and part of Mykonos town, (3.5km away). Entrance is at ground level where there is an elevator or stairs to the accommodations on the main floor and top floors. Designer interiors include two lounge areas, fully equipped kitchen and dining room on the main floor that open to generous terraces where the infinity pool merges seamlessly into the sea – the views are breathtaking. The two king bedded master bedrooms and two twin rooms with en-suite marble bathrooms, enjoy panoramic views from their private balconies. Situated at the top of our 20-acre property, lies the second gem of our elegant resort – a newly renovated additional Presidential Villa. 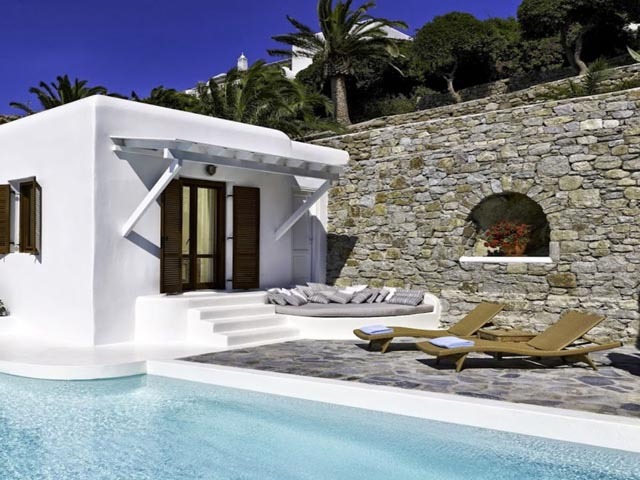 This elegant four-bedroom villa enjoys a stunning natural setting with magnificent views over the Aegean sea, neighboring islands and part of Mykonos town, (3.5km away). The one king bedded master, a queen bedded guest room and two twin rooms with en-suite marble bathrooms, enjoy panoramic views from their private balconies.Entrance is at ground level, whereby lies the living room, dining room and kitchen. A Guest Room with ensuite bathroom is also located at ground level following where stairs lead to the remaining three ensuite accommodations, two of which on the first floor and one on the top floor. The outdoor offers generous terrace with teak dining furniture, rattan lounge sofas and a generous pool merging seamlessly into the sea. Strategically located on top of our 20 acre property, this newly built, exclusive 6 bedroom residence offers an unparalleled location that combines privacy with panoramic views of Ornos Bay and the surrounding areas. Villa Horizon features cutting edge design with fully equipped facilities that range from a fully stocked kitchen and dining room to a private fitness area, spa and laundry room. At the entrance level of the Villa, guests will find a living area of magnificent proportions with floor to ceiling windows that open up to create a seamlessly open space with the outdoor terrace and private infinity swim- ming pool. Villa Horizon’s magnificent master bedroom occupies an entire level and fea- tures a private terrace with lounge chairs and direct vistas towards Ornos Bay. Our private villas enjoy all the services and facilities of the hotel including BUTLER SERVICE, 24-hour room-service and twice daily housekeeping service. All villas have private parking. Santa Marina offers exclusive private charters, Jet plane, speed boat and limousine services. The resort is gated with security and bodyguard or guide services upon request. The contemporary interiors of the villas are elegantly furnished with beautiful island colors, all recently decorated or re-furbished. All villas have outdoor teak sunchairs, dining tables and rattan lounge sofas. All the villas are a short walk from the main hotel facilities, restaurants and private beach. It's your body's fundamental daily journey toward balance and it's the foundation for everything we do at the Lotus Spa. Against the vibrant hues of the Aegean and the Cycladic sun, where every detail has been seamlessly choreographed to the science of time, resulting in the ideal state we call "harmonia". Santa Marina LOTUS SPA helps revitalize your spirit, expand your boundaries and explore new ways to lead a healthier, more fulfilled life. As soon as guests walk into our serene spa - comprising a professionally designed hammam or Turkish bath, sauna, and lounge area - they are provided with a plush bathrobe and slippers. The internationally renowned natural product lines Ila & Phytomer, and calming music set a scene of incomparable repose while lovely sea views transport them into a world of wellbeing. Our serene state-of-the art Fitness Center is furnished with renowned Technogym, Cybex, and Power Plate equipment and complimentary to all resort guests. The room is distinguished by a combination of whitewashed walls and windows that illuminate the sleek dark wood floors and look out over arid island hills towards the sea. We are pleased to provide towels for guests’ convenience. Santa Marina’s unique feature, our private sandy beach, provides a secluded, unrivaled space to swim and sunbathe next to the crystal clear Aegean Sea. We are pleased to provide guests with complimentary umbrellas, chaise lounges, and beach towels. 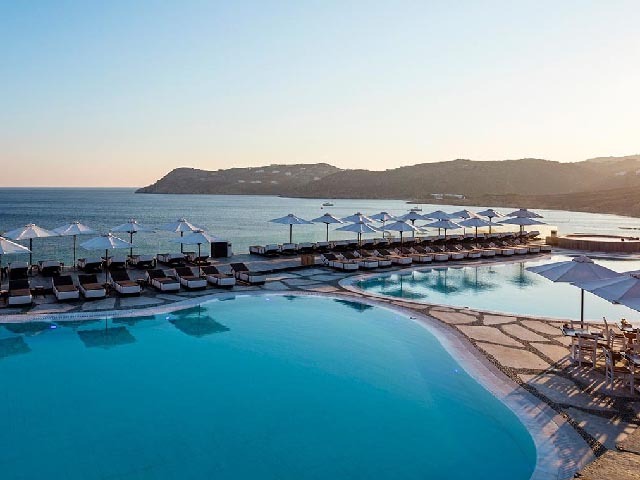 Guests at Santa Marina may choose between our main Infinity Swimming pool which is ideal for lap swimming and is located next to our sun deck or unwind at our Colonial Infinity pool that also features a relaxing open air whirlpool with majestic panoramic views to the Aegean Sea. Our Children’s Pool provides a safe space for youngsters to play and enjoy the water element next to our Lappset playground area. Dedicated to the pleasure and enjoyment of our young guests, Santa Marina’s Kids Club is a unique facility that caters to children from 3 year olds onwards and operates in specially configured indoor and outdoor fully equipped facilities that include a Lappset playground with its own dedicated children’s pool. Children can enjoy beach toys, jigsaw puzzles, DVD movies, coloring books & crayons and other activities, all under the exclusive supervision of child care specialists. Our state-of-the art tennis court is floodlit and equipped with an artificial sand top and is available for play on a daily basis to all our guests. Our resident Tennis Instructor is at hand to arrange lessons and practice sessions for both adults and kids. Next to our main lobby and leading to our Lotus Spa and fitness center, guests may find a selection of boutique stores that include a kiosk, jewelry and clothing boutique store. All stores are open and available to our guests daily. Resort guests may also “window shop” at our extensive displays as these available throughout our public areas. Nestled above the private resort beach the Buddha Bar offers one of the most glamorous and sought-after bar and dining experiences on Mykonos. Its world-renowned blend of gastronomy, mixology and music, brings Raymond Visan’s vision to the Aegean for the very first time. Sit back with a stellar cocktail and listen to our resident DJ spin his signature mix, as the guests from the superyachts step ashore to join you, and the buzz of conversation gently gathers. It’s the kind of ad hoc, effortless socialising that happens when beautiful people are drawn to a beautiful place. The new Colonial Pool Restaurant, open all day long, offers destination dining for non-residents, and the ideal spot for guests dining en famille, overlooking a breath-taking, beachfront pool. 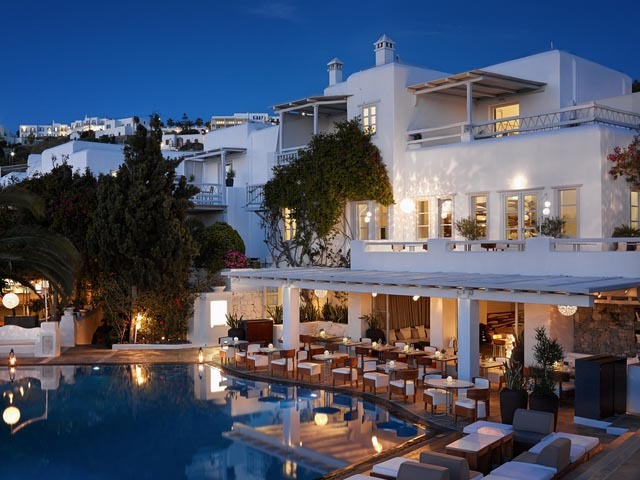 With its beachfront setting and a seaview to die for, the Colonial offers a glamorous al fresco bar and dining experience in Mykonos. The luxurious outdoor space with its unrestricted view entraps you with its changing moods. The daytime lounging area by the poolside becomes a perfect chill out zone in the evening with the iridescent blue pool as the stunning centrepiece. Glowing candle lanterns by the poolside and bar add to the mood of the space. Overlooking the Aegean Sea and offering breathtaking views our beach bar ensures guests’ needs are conveniently met, serving everything from healthy snacks to full main course signature dishes and cocktails. For those who wish to enjoy the open waters, we offer exclusive speedboat services. Our rubber speedboats, available for an hourly rate, are ideal for exploring the beautiful beaches or nearby islands in comfort.